The Norfolk Broads have long been home to some spectacular fishing but on hem, more than on many other venues, ;port can be patchy, especially in winter. Nater craft is vital: get it wrong and you night not see a single fish all day, but get it right and you could be in for some truly unforgettable action. This is true of all the major species – from shoaling fish such as roach and bream, to he predatory pike which follow them. In winter they tend to be restricted to areas of deeper water. Rockland is fairly small as broads go, but till covers about 80 acres. Most of the wide expanse is shallow and fairly featureless, md fish can come from anywhere. But to have the best chance of contacting the many pike to over 20lb (9.1kg) during the winter months, find the deeper water. Ronny Watson anchored about 15m (17yd) from the drop-off in Long’s Corner to fish both deep and shallow water. The resulting action was hectic. The week before this trip it was very windy. 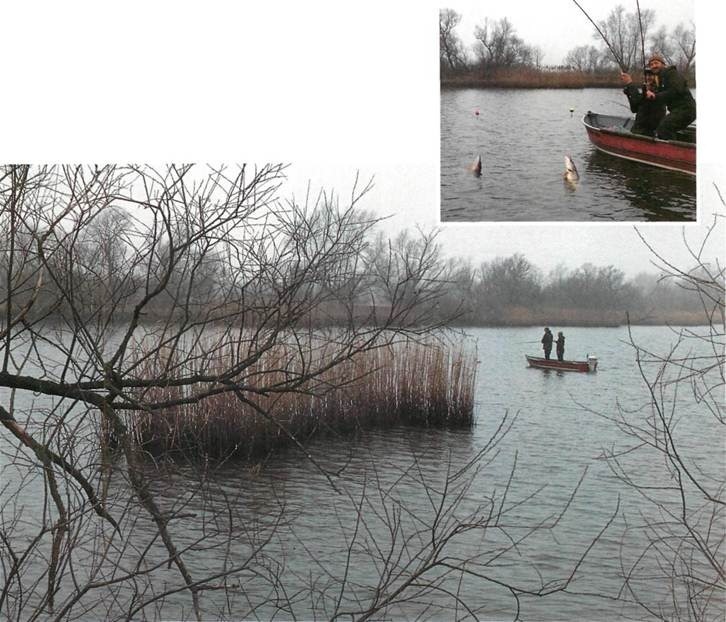 Ronny was checking conditions in his boat (fitted with outboard) and found two anglers marooned in the reeds at the far end – trapped by the wind. If he hadn’t towed them to safety they might have been there all night. Don’t take risks with the weather on any broad. Rockland Broad is free to fish but you need a boat. There are two for hire at the marina in Rockland St Mary. Phone Mr Dye on 05088 256 to book them. 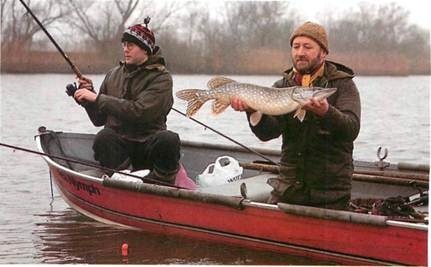 The broad holds lots of pike to high twenties, as well as roach and bream too, especially in summer. 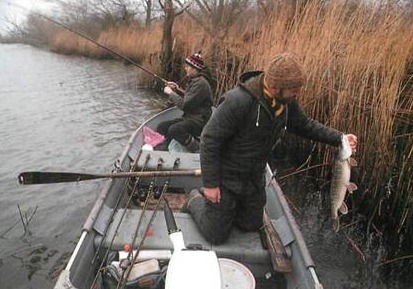 For expert help with broads piking, contact angling guide Ronny Watson on 0603 484262. The reed islands look good places for pike (1). They seem to provide cover in the otherwise featureless broad. However, the water round them is too shallow for winter fishing – as you can see from the exposed mud. The black tide mark on the stems shows the water level to be some 90cm (3ft) down, so it’s about low tide on the broad Ronny holds up a nice 8lb (3.6kg) fish which took a paternostered live roach. On the day, livebaits proved most successful, with a run coming almost as soon as the bait hit the water, but it’s wise to take a selection of deadbaits since they are often what the pike want. Take the A146 from Norwich towards Lowestoft (Ashby St Mary is too far, so turn back if you reach it) and turn left when you see signs to Bramerton and Rockland St Mary. 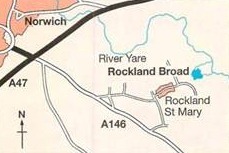 The marina is at the far side of Rockland St Mary coming from Norwich On the day, Long’s Corner was full of pike. Some were in the deep water scar, but others, such as this one which fell to a plug, were in barely 2ft (60cm) of water in the bay. Instead of plumbing up to find the depths and locate the drop-off, you can use an oar to find out how far off the bottom you are. Here Ronny Watson demonstrates the technique – just stick it down into the water until you hit the bottom. The only way to get around the broad and find the best areas is by boat. Bank access is extremely limited and fishing is only really practicable afloat. There are a couple of boats for hire at Rockland St Mary Marina – at least one is usually available. 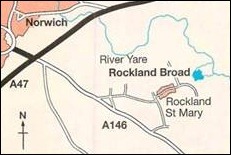 An important point to remember when setting float and paternoster depths is that Rockland is connected to the tidal River Yare, so the depth can vary by up to 60cm (2ft) over a day. A handy way to tell the state of the tide is to look at the stems of the reeds. There’s a very definite tide line of black mud, so if you can’t see it, it’s high tide, and if there’s about 60cm (2ft) showing, it’s roughly low tide. There are only a few areas of deep water on the broad but you can turn this to your advantage. If the shallows don’t produce, you don’t need to look very far for deeper water. Of course, it wouldn’t be so great if the water were teeming with pikers — the deep water spots would be very busy. But here you can count yourself unlucky if you see another angler on the broad all day. The boat channel is the most obvious area of deep water. It runs from the dyke leading to and from the marina at Rockland St Mary almost straight across the broad to Short Dyke which leads to the River Yare. The channel is some 60-90cm (2-3ft) deeper than the surrounding areas and can fish very well. It’s well worth having a go along its length, especially if other areas are unproductive. Fish it in sections, moving every half an hour until you find the pike. The junction of the boat channel and the dyke from Rockland St Mary is a good, consistent mark. It’s also the easiest spot to fish if you’re using the hire boats, which come with oars but no outboard. It’s close to the marina, so it isn’t too long a row. Long’s Corner is on the far side of the broad — the south-east corner. It’s on youi right as you approach Short Dyke from the marina end. It is a shallow bay, shelving up from about 1.2m (4ft) at mid tide, towards the reed-lined banks. The main area of interest in Long’s Corner is a deep scar about 20m (22yd) wide and about 50m (55yd) long. It runs into the corner from towards the middle of the broad, past the south side of a large reec island. The scar is some 1.2-1.8m (4-6ft deeper than the surrounding water, making it a real winter hotspot. The drop-off from the bay in the corner nto the scar is a good place to put a live or deadbait, the deep water of the scar fishes veil and the shallow bay also produces. 3osition your boat about 15m (17yd) from he drop-off so you can easily reach all three areas with a short cast. The reed island looks a very attractive irea to start hunting for pike, seeming to offer cover in the emptiness of the broad. However, it is a sign of very shallow water and in winter you should steer clear of it. Finding the deep water the first time you visit the water isn’t hard. You can plumb up or use a fish finder, if you’ve got one. But the easiest way is just to stick an oar straight down until you hit the bottom. This soon gives you an idea of the depths. A word of warning – the wind can make conditions extremely unpleasant fairly quickly. The broads have no protection from the North Sea and are completely exposed to northerly and easterly winds. Not only does a strong, cold wind make fishing difficult, rowing back against it can be impossible. Night in an open boat in winter on a gale-whipped broad is no joke. During the summer the pike tend to be more spread out. But the boat channel and Long’s Corner with deep and shallow water in easy reach are both good places to start. During the warmer months, the broad is unrecognizable as the bleak icy water you . saw in winter. Thick beds of lilies carpet the surface of much of the broad, apparently making fishing impossible. Don’t be put off however; both the deep and shallow water fish well, and the pike clear a space themselves as they drag your line (it must be strong) through the lily stems. And if you make regular visits, they clear a good-sized area of the lily beds into which to drop your baits. If you take sensible precautions (don’t go out when it’s windy without an outboard), and are ready to fish deep and shallow water, there’s no reason why you can’t enjoy a superb day’s sport. On the day we visited, Ronny found a pack of hungry pike in Long’s Corner and caught no less than 21 fish to low double-figures before he ran out of bait!